Retiree Mentors at Training, Inc.
On March 21, with the assistance of Mayor Martin J Walsh, State Representative Dan Hunt, State Representative Dan Cullinane, City Councilor Andrea Campbell, City Councilor Anissa Essaibi George, and Boston's Chief of Education Rahn Dorsey, the Dorchester YMCA proudly cut the ribbon on their expanded Academic Credit Recovery Center (CRC). 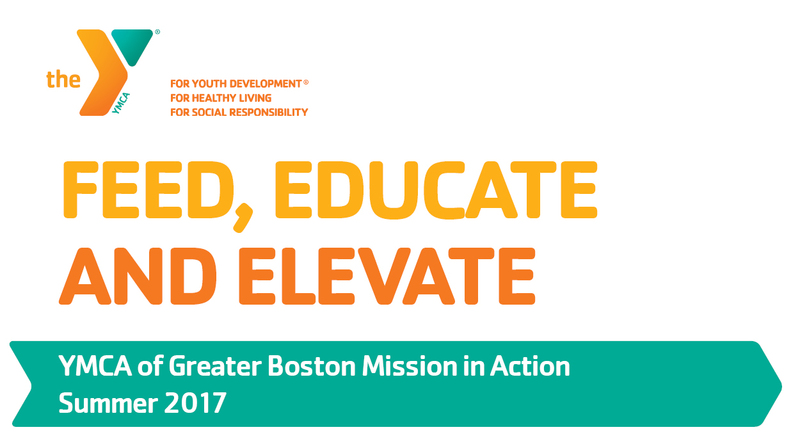 In partnership with Boston Public Schools (BPS), the YMCA of Greater Boston has launched Credit Recovery Centers for high school students in neighborhoods where youth are at-risk of dropping out. Due to popular demand, the Dorchester YMCA, a hub site for the program, has renovated and expanded its CRC lab featuring new equipment and resources to meet the needs of the community. The program has been oversubscribed since it launched in Dorchester this past fall. Students who utilize the lab are offered course assistance from public school teachers and counselors, healthy dinners and snacks, and a free YMCA membership. When a student fails even one credited course, their odds go up of not graduating on time or, worse, dropping out altogether. The YMCA of Greater Boston took notice of this troubling trend and stepped in to offer an inviting and comfortable space that looks and feels like a teen center where students can make up failed courses and stay on track to graduation. The CRC Labs, currently available at the Dorchester and East Boston Ys, offer early morning and late evening hours to give students the flexibility and support they need. 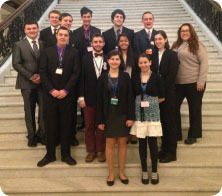 The Parkway Community YMCA recently took a delegation of 15 teens to the annual Youth in Government Conference at the Massachusetts State House. These delegates worked all year to prepare for the conference, writing bills to be debated, articles to be published in a mock paper called “The Beacon” and taking part in mock trial simulations. After a tour of the House Chambers and Speaker’s Gallery with State Representative Paul McMurtry, the Parkway Y delegates were presented with a formal citation signed by the Representative and the Speaker of the House. At the final awards banquet, the Parkway Community Y’s Teen Director, Becky Peluso, was selected to accompany the Assistant District Attorney of Middlesex County on an inaugural trip to the National Judicial Conference in Chicago in August. Additionally, 3 of the 9 teen delegates chosen to attend the event were from the Parkway Community YMCA. The Parkway YMCA Youth in Government teens were awarded the Premier Delegation Award for exceeding the expectations of a Youth in Government delegation and for their civic engagement. The YMCA of Greater Boston is always looking for ways to keep our group exercise offerings fresh and filled with exciting new ways to move. Our East Boston and Huntington Ave Ys are now showcasing POUND in their free membership group exercise offerings. 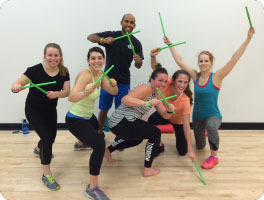 POUND is an exciting full-body cardio jam session, combining light resistance with constant simulated drumming. The workout fuses cardio, Pilates, and plyometric and isometric movements into a 45-minute series. The Huntington Ave YMCA also now offers BollyX - a Bollywood-inspired dance fitness program that combines dynamic choreography with the hottest music from India. The dances cycle between higher and lower intensity movements to get you sweating and smiling at the same time. Both classes are open to all fitness levels, for men and women of all ages. If you're looking for a way to liven up your workout routine, check out the hundreds of group exercise classes available at our Ys. Progress is continuing on the renovations at our Parkway Community YMCA in West Roxbury. 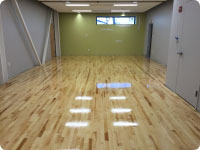 Flooring and electricity are currently being installed in the new fitness center, with the fitness equipment scheduled to be installed next week. Tiles are also going into the new pool this week. Phase 1 of the renovations was completed in the fall, with the opening of the new locker rooms and parking lot expansion. 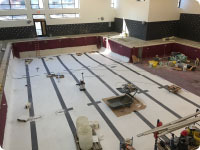 Phase 2 - which includes the updated fitness center, exercise studios, pool, child watch area and teen center - will be completed and open to members in mid-April. The third and final phase of construction - including the main lobby and gym - will be finished in June and will be celebrated with grand re-opening event. We are excited to be able to provide an updated and welcoming facility accessible to all in the West Roxbury, Roslindale, Jamaica Plain and Dedham communities. Check out our Facebook page for more updates. 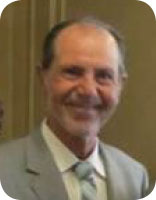 John Faldetta, 73, the former director of Global Logistics at Gillette for 34 years, has served as a mentor and guide to participants at YMCA Training Inc. for the past 13 years. Faldetta volunteers weekly with the program, guiding trainees through resume and cover letter writing, interview preparation and job search, and helping to build their confidence. 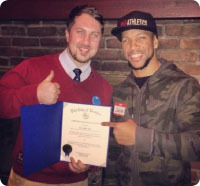 Each year, YMCA Training Inc. graduates are hired at more than 50 major companies in Greater Boston, such as Eastern Bank, Boston Medical Center, City of Boston, Dana-Farber Cancer Institute, and Suffolk University. Since its inception in 1984, Training, Inc. has graduated nearly 5,000 people from the program. Last year, Training, Inc.’s total graduates earned $103.5 million and paid $25.8 million in taxes. YMCA Training, Inc. helps Massachusetts residents get back to work. The free, 20-week program provides computer and office skills training, a two-month internship program and corporate employer partners to get the underemployed and unemployed working again. The state unemployment rate is 4.7 percent. Each session Faldetta is assigned up to six trainees, who describe him as ‘tough but fair’. He sets expectations for all his mentees, and helps them reach goals and strive higher then they think they are capable of, he says. Graduates of the program keep in touch with their mentor as they negotiate raises and promotions in their new positions and reach out to Faldetta for guidance. For more information about the Y's Training, Inc. program or to provide your support, please visit us online. Recently a certificate of recognition was presented to our Oak Square YMCA and Calder Akin, Director of Youth Development and Sports. Mayor Martin J Walsh and the City of Boston honored the overall work of the Oak Square directors for their dedication to teaching children to become healthy, happy and helpful citizens through sports and team work and in appreciation of the innovative programs offered to enhance all children’s development at the YMCA and throughout the City of Boston. The Oak Square YMCA was nominated for this award by the Ernst family, whose three-year-old son is actively involved in many programs and services at the Y.